Take a journey around the Scottish Region during the 1960s in the style of those marathon railtours that existed back then. 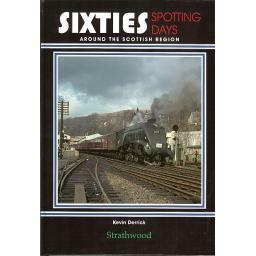 Whether you managed to get around Scotland during the 1960s or not you will be awakened by the variety of locomotive types that could be found during the decade. Among the chapters we have covered the final years of the Gresley A4s on the Aberdeen to Glasgow expresses. As ever our nostalgic captions will captivate the reader, not to be missed. Locations within this volume include: Perth, Aberdeen, Inverness, Eastfield, Polmadie, Dunfermline, Oban, Kyle of Lochalsh, Beattock, Ayr, Edinburgh and many more.